Off Grid in Maine and Loving It! Some of the most affordable and beautiful properties for sale in Maine don't include power lines! 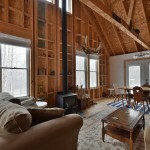 Check out this new off the grid listing in Otis, Maine in the heart of Hancock County. The cabin has nearly 1,200 square feet of living space with 1 bedroom on the first floor and a large loft to accommodate multiple guests. 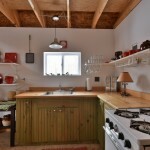 A fully functional kitchen and full bath/laundry round out a cabin with a large living rooms with cathedral ceilings. The cabin sets on the western boundary of the property with sunrise views over the hardwood forest. 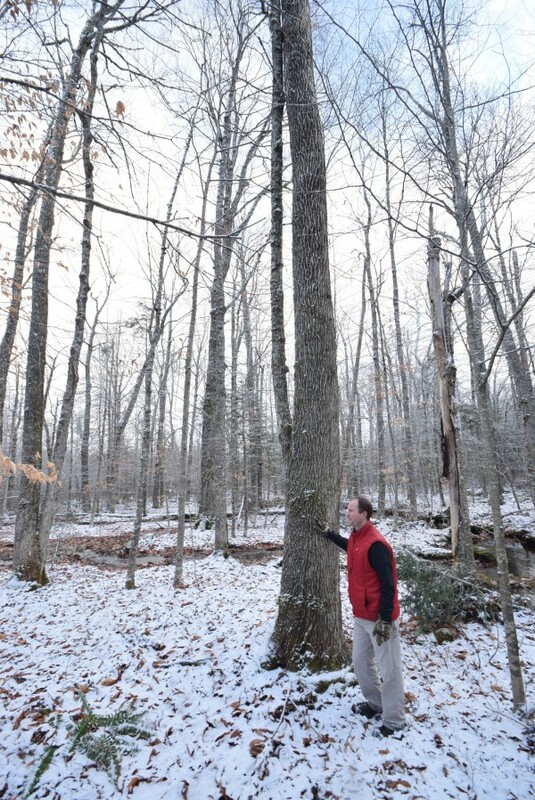 The 52.4 +/- acres has some beautiful hardwood timber with impressive examples of ash and maple trees. There is a lot of game sign on the property from whitetail deer to grouse and other upland birds. The lot has a babbling mountain brook running through the property with slow pools mixed with small waterfalls. 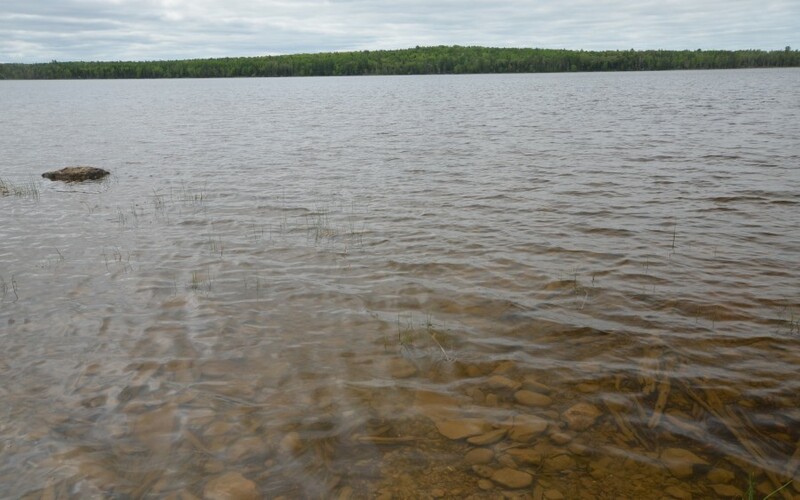 This property is located on a ridgeline between several of Hancock Counties best cold water lakes and Ponds. Beech Hill Pond, Green Lake, Floods Pond, Mountainy Pond and Burnt Pond are all within a short distance of the land. 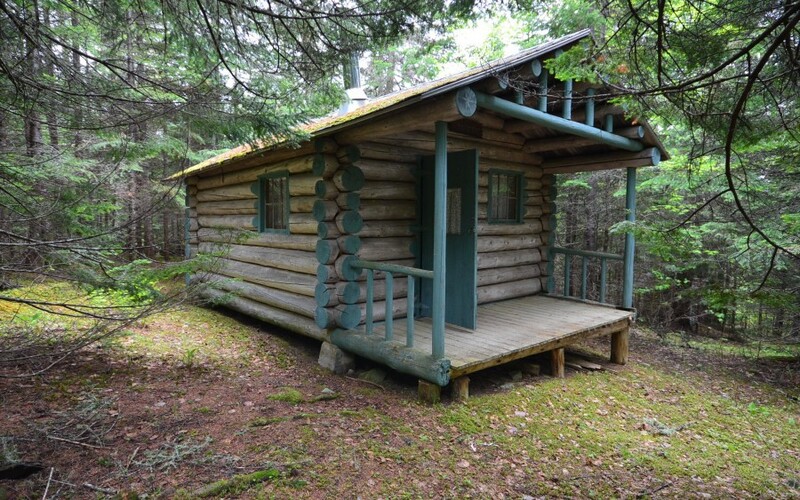 This is a great property for a seasonal vacation spot, hunting cabin or year round home. Located between Bangor and Ellsworth it is a reasonable drive to an international airport and Bar Harbor and Acadia National Park. 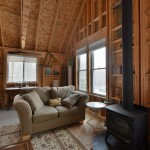 Are you ready to get back to a more simple lifestyle and relax in the woods of Maine? Maybe you just need a weekend place to get away, no matter your motivation, come see this perfect coastal mountain retreat today. We had a successful hunting season in Maine for 2015. Everyone in our hunting party saw deer, had some good naps on stand and just enjoyed being in the Maine woods in Hancock County. 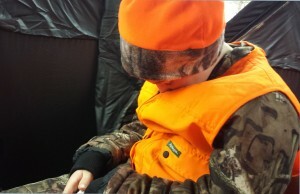 In the post you will see a photo of my 10 year old nephew, Gavin, enjoying a nap on stand. Gavin bagged his first turkey in May and bear in October, but the whitetails were intolerant of the snoring sounds coming from his blind. Throughout this year we worked on clearing new hiking and ATV trails throughout the northwest section of our family woodlot. Along these trails we installed two ladder stands on a ridge of mature maple and pine trees overlooking one of the small babbling brooks that meanders through our land. 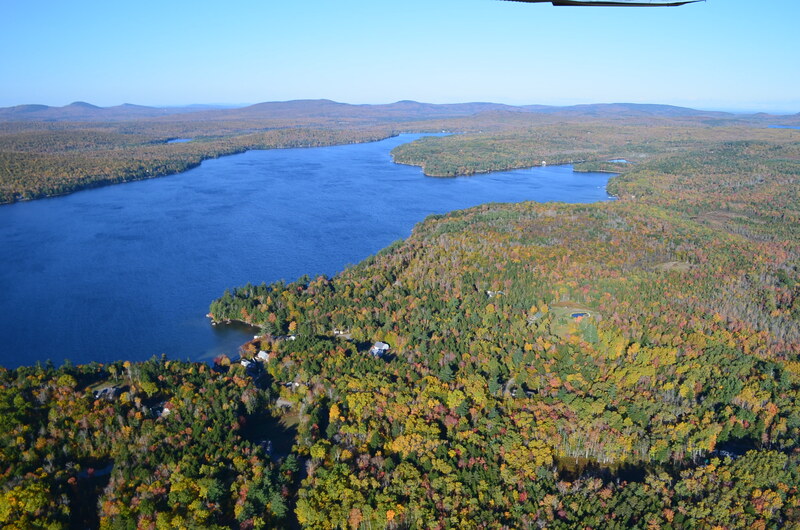 From our stands we also have a view of Blue Hill Maine and Mount Desert Island and parts of Acadia National Park. Even on the days we don't see deer the views are nice. The trail work paid off as my brother harvested a nice 8 point buck that dressed out just under 190 pounds. To make the job of getting the deer out of the woods, our neighbor Nick and his 3 year old son Colby drove their ATV out our new trail and drug the deer out for us and even hoisted the animal onto our truck. Thank you Nick! We have found the deer like to use our new trails along with other game animals. To smooth out some of these trails and remove stumps we plan to have Jeremy Guellette of Ground Perfection Specialists spend a day or two with his grinder cleaning things up for us. The machines you see clearing the sides of I-95 north of Lincoln is Jeremy's company. Once cleaned up we will seed down the trails and plant some small food plots. Our forester also recommended cutting back the 7-10' poplar in areas. This will cause the poplar to reshoot new seedlings and will be a "natural" food plot. We enjoy working and improving our woodlot. Owning land in Maine has many benefits but to me one of the tops is the therapy of doing physical labor and discovering new areas of your Maine land and how to best take advantage of the topography and other features. A few months ago my wife fielded a call from a young lady from Michigan who inquired about hunting bear with Mountain View Drifter Lodge & Outfitters. She asked a lot of questions, most of which my wife who works closely with me could answer. She also wanted a call back from me for guide specific questions. We had a very pleasant conversation where I talked about the hunt we provide and asked her a few questions as well. She indicated she and her hunting partner both were interested in hunting black bear with archery equipment. I described the stands I use, typical shot distance and spoke a bit about black bears. 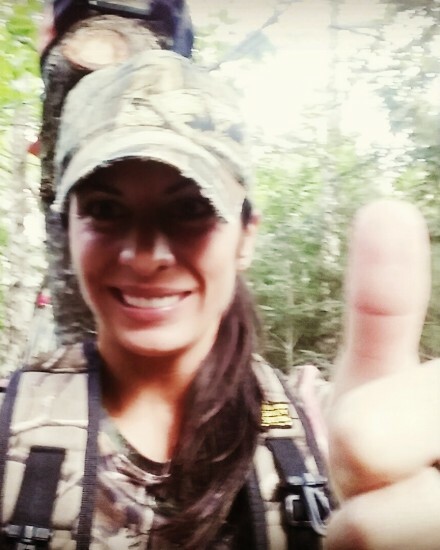 Alissa decided to book her hunt with us for the first week of the 2015 bear season. Alissa and her friend drove through the night from Michigan and arrived in Millinocket, ME around 11 a.m. on Sunday. After they and our other guests settled in for the week we served a meal of Maine lobster. After lunch we went over bear behavior, shot placement, and everything a new bear hunter needs to know to possibly have a chance of filling their bear tag. Next we moved onto proficiency with their hunting weapon. Alissa was able to group her arrows pretty well into my 3-D target, even after riding all night from Michigan. 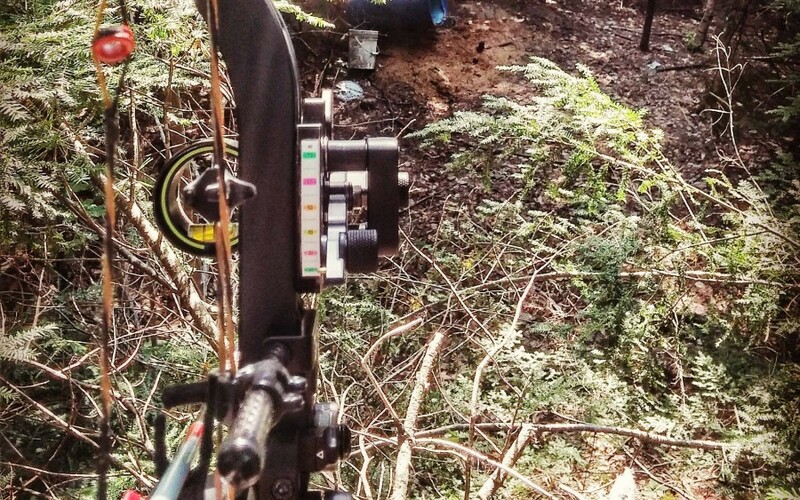 She shot well from ground level and from the elevated stand that mimics a hunting situation. The following day found Alissa shooting at the 3-D target prior to the hunt. It was obvious she is a very dedicated archer. After lunch everyone donned their hunting apparel and gathered their gear as we headed off to the Maine woods in search of black bear. It took a couple of hours to get everyone out to their stands, and Alissa had to endure the long bumpy road to the archery stand I had set up in a swampy area that had a lot of bear activity. We walked into the bait site and I indicated silently where her stand was located. She tied off her gear to the rope and scampered up the tree steps and secured her safety harness to the tree. I then baited the site and slipped away to allow Alissa to sit motionless for the next several hours. On this first day of the hunt I had no calls from anyone harvesting a bear. Once all the hunters were gathered up and we were heading back to the lodge I learned that everyone had seen black bears on their bait sites, but had not shot any. In Alissa's case the bear she saw, probably saw her too. It had started to come into the bait site, then turned and headed back the way it came. That's what bears do when they determine something is not quite right in their neighborhood. Tuesday began much the same way as Monday. Alissa shot her practice arrows. We had lunch, and we headed back to the woods in search of bear. On the way in to Alissa's stand I reiterated that you need to sit still and allow the bear to fully commit to the bait. Alissa and I headed into the bait site, she climbed into her stand, I baited the bait and slipped away. Later that afternoon I received a text message; "Bear down! Dead 15 yards from tree". Well that was good news. I responded; "who shot", since there was no name on the text. I received the following,"Me!". Well I sort of knew who shot, but I had to be certain, rather than accidently walk in on the wrong hunter. So I wrote,"name". To which I received,"Alissa". Well now I was off and running. I arrived at the site, Alissa pointed to the bear that had been perfectly shot laying dead just a few yards from her stand. She climbed down and we went to admire her trophy. After some photos Alissa assisted me in carrying the bear through the swamp to the truck. We met up with the other hunters and headed back to the lodge for some well deserved congratulations. If you want to be successful in hunting an animal you never hunted before, a qualified guide is a good place to start. 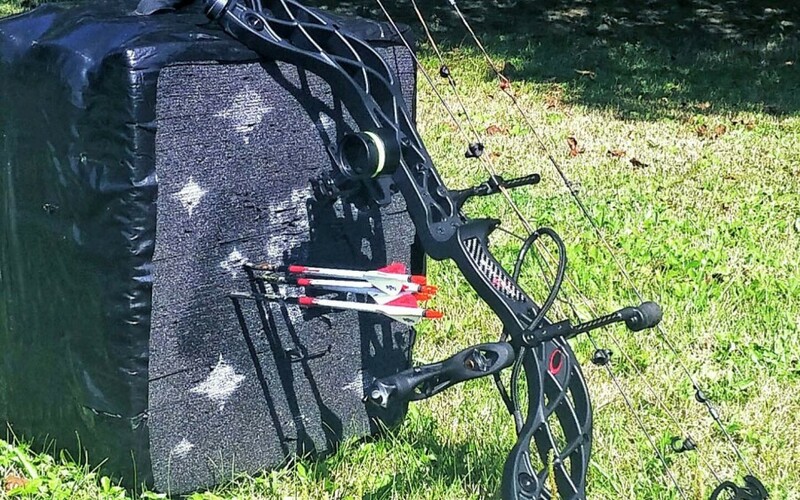 But beyond that you need to dedicate yourself to practicing with your hunting weapon. Alissa's months of practice allowed her to even after sitting motionless for several hours to draw her bow, pick her spot on the bear and release her arrow, all undetected and executed perfectly. 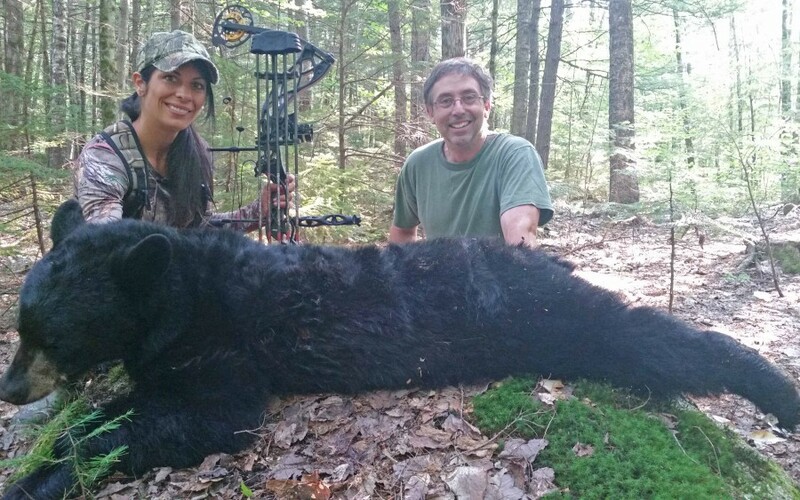 Congratulations Alissa on your first Maine black bear! The Nowland Brook Forest provides an exceptional opportunity to purchase a family recreational retreat property. The parcel consists of 349+- acres of heavily wooded land with nearly 2 miles of interior gravel roads. There are numerous paths and trails to hardwood ridges, beaver ponds, woodland meadows, and dark spruce forests. The varied terrain and privacy of the acreage make this property exceptional as a hunting retreat. Moose, black bear, whitetail deer and plentiful grouse call this place home. You can also find marten, fisher and bobcat hunting the forest edges in search of plentiful snowshoe hares. The improvements to the property are numerous. There are 5 hand scribed log buildings that make up the heart of the retreat. The main camp has a bedroom, dining area and kitchen within its 500 square feet of log construction. 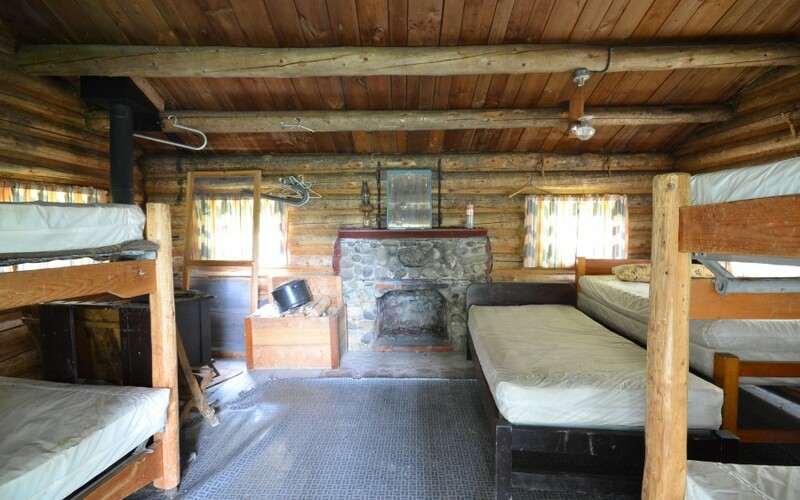 This cabin was built around 1936 and formed the base for what now is a 5 cabin compound. The other cabins are named Wildcat, Spikehorn, Big Bear, and Pine Marten. 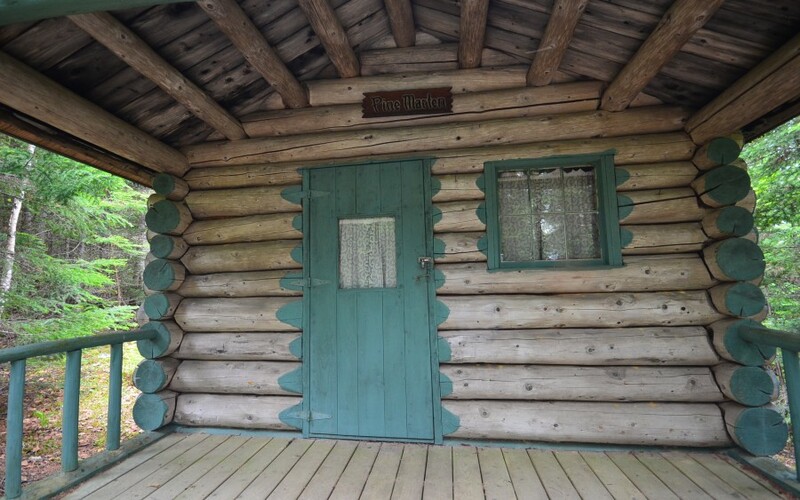 Each of the cabins is a hand scribed log structure that was built in the 1930s from logs harvested on site. Each cabin has a woodstove for heat during the cooler seasons, as well as beds for sleeping. Wildcat, Spikehorn and Pine Marten are each approximately 150+- sq ft in size. Big Bear is 252 +- sq ft of log construction. 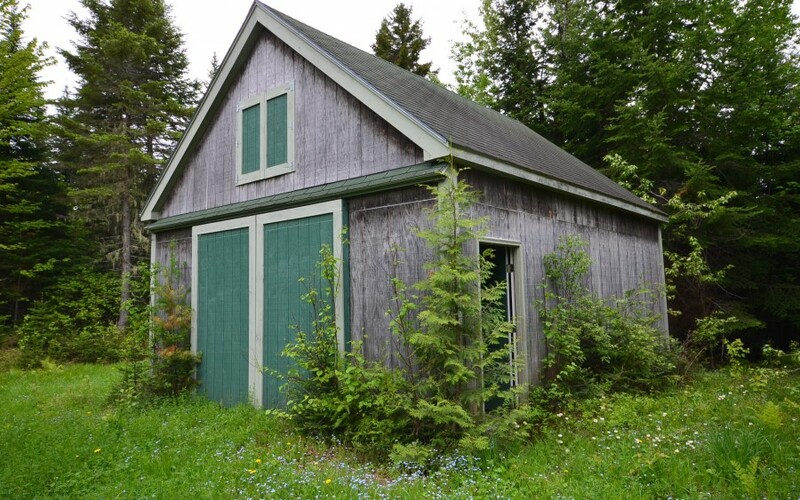 There is a tool shed near the cabins that is 96+- sq ft as well as a wood shed and two log constructed outhouses. A few hundred feet from the cabins a 480+- sq ft barn, with a concrete floor and second story storage is there to provide a place to house your atvs, canoes and other recreational tools. The soils near the barn have been used for gardening and are still open and tillable. There is a drilled well located about 100 feet uphill from the cabins and it provides drinking water to the main cabin via gravity feed. There is a hand dug well that has cool spring water available to use as well. 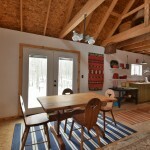 Lighting in the cabins is produced by gas lights using propane that is delivered to the site by Dead River Company located in Ashland, ME. For more details call Rick Theriault at 207-731-9902. The price on this property is just $225,000! This Saturday, November 1 marks the start of the 2014 whitetail deer rifle season. 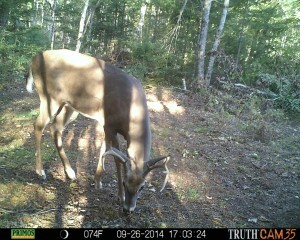 For all you last minute planners out there here are links to the hunting hours chart from Maine DIFW and the Hunting and Trapping rules and regulations for 2014/2015. If you forgot your license you can log in and buy online with the link at the bottom of this post. Good luck and be safe.